Is the True Wealth Newsletter any good or is this just another over-hyped product that isn’t going to live up to the claims it makes? I’ve been seeing a lot of questions recently about whether or not this newsletter is a scam so that is what I will be addressing here today. There are a lot of crap investment newsletters out there so this is a good question to asked and it needs to be done. In this review I’ll be going over the basics of the newsletter, what you get, what other people are saying about it, whether or not its worth the price and more. 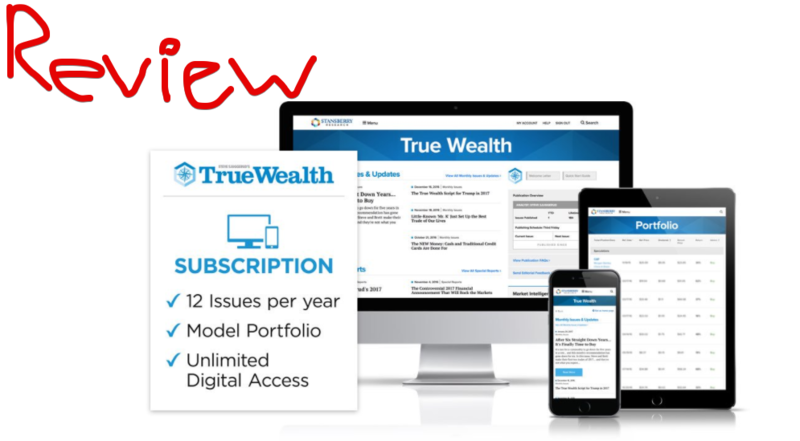 What Is True Wealth Newsletter? Well… as you can tell and you probably already know, True Wealth is a newsletter. It is a newsletter that provides investment advice on a monthly basis. The man in charge, the editor is a guy named Steve Sjaggerud. He is a former stock broker with a pretty amazing history. Supposedly he became the VP of an international mutual fund that was trading at over $50 mil when he was only 23 years old. And Brett Eversole is the lead analyst for the letter. From what I can find on both of these guys they seem to be good at what they do… not really anything in the way of complaints that I have found. But anyways… back to the newsletter. According to Stansberry Research, the firm behind it, subscribers should have at least $1,000 that they are able to invest beforehand. And I would probably say that you are going to want more than this. $1,000 isn’t much if anything. The method that Steve and Brett focus on in this newsletter is to “Buy assets of great value when no one else wants them… and sell them when others will pay any price.” They look for the overlooked investment opportunities that have the potential to make some serious gains. These are the ones that no one is talking about or that people are talking negative about, yet have the ability to get you some decent profits. Overall I would say that this newsletter is definitely no scam. I have reviewed plenty of other investment newsletters including ones like True Momentum, Profits Unlimited, Real Wealth Strategist, etc, and most don’t have as good of reputations as this one. True Wealth seems to provide very sound investment advice. Although I don’t consider True Wealth a scam at all, they could tone down their marketing campaigns a bit. Since you are reading my review here wondering if True Wealth is a scam, there is a good chance you came across some rather ridiculous sales pitch for this newsletter that made you hesitant to buy into it. Over-the-top ad hype and misleading claims are all too common when it comes to investment newsletter. I have found this to be the case with the majority of them out there. But the bottom line still remains: the newsletter itself is still good. They may lure people in with somewhat deceptive tactics but it still is not a scam. Monthly Issues – This newsletter subscription lasts for 12 months and includes 12 monthly issues. These issues will give you an in-depth look at different investment recommendations as well as market analysis. You will also be able to see their model portfolio and look at how good the recommended investments really have been. The Stansberry Digest – This is like an added bonus I guess you could call it. I don’t know if this always comes with the subscription but when I was just looking into it showed that this is a included. What is it? This is a daily newsletter about what they think is going on in the market. It won’t provide as in depth information and is more basic, but its good to keep up with current events and just to give you a general sense of what is going on. I have reviewed many bad investment newsletters before that have been more focused on sucking the money out of subscribers’ pockets rather than helping them make good investments. This is not one of these newsletters. The review for this newsletter are overwhelmingly positive. There are many long-time subscribers and I even read a couple reviews talking about how good investment advice it provided back during the “great recession” of 2008. I welcome you to search for complaints of this newsletter on your own, which is something I would actually something I would suggest doing if you’re planning on buying in, but you probably won’t find much. Conclusion on True Wealth – Is It Worth The Price Tag? The cost of this newsletter is $199 for a yearly subscription. This is a decent sized price tag but I guess you get what you pay for. Many of the $50-$100 subscription newsletter products that I have reviewed aren’t very good and it’s no wonder. Is it worth the price? Well I guess the answer would partially depend on how much you have to begin investing in the first place. If you are going to be able to invest a good bit of money in the recommended stocks but this newsletter makes then you will be able to recoup your $199 investment rather fast, but if you don’t have much money to start with it will take longer. That said, either way it seems you should be able to recoup your money. The investment advice provided seems to be very sound. Of course there is always some risk involved with investing like this and not every recommendation that True Wealth provides is going to be a winner, but this just comes with the territory. Don’t Just Follow Their Every Investment! If you are going to buy into this newsletter it’s always good advice to do your own research. Don’t just blindly follow the investment picks that the newsletter makes. Take those pics and then look into them on your own. If you like what you see then follow the advice but if you don’t then there is no harm in avoiding the opportunity. Ultimately it is still your choice what you investments you make. The newsletter can be used more as a guideline to helping you make the right choices. These newsletter will dig up investment opportunities that you may not even be thinking about or maybe have never even heard of and then you can further look into them. This is at least what I would do and what most people would say you should do.